ST. LOUIS – The latest unforgettable moment in this World Series of Weird hatched itself a few days ago in a small room packed with Boston Red Sox. Advance scouting meetings can be laborious endeavors, information overloads during which some players go into la-la land rather than try to remember every little bit of minutiae coaches impart. During this particular meeting, coaches spoke about the baserunning tendencies of St. Louis Cardinals hitters. When they got around to Kolten Wong, a rookie likely to pinch run, they warned the pitchers. Lately, he had gotten more confident with his leads. He was vulnerable. The corollary to that, then, should be how Boston's scouting genius finished off Game 4 of the World Series on Sunday in unique fashion. Only that's not really true. A combination of luck, instinct and technical perfection gave baseball its first walk-off pick-off in 109 years of postseason play and a perfect companion to the oddity of the previous night, when the Red Sox lost a game on an obscure obstruction call. 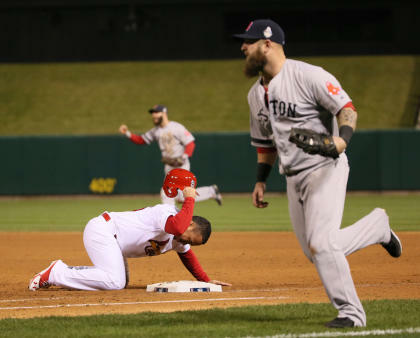 The runner in Game 4 happened to be Wong, and his blunder left Carlos Beltran, one of the greatest hitters in playoff history, standing at the plate as the tying run in St. Louis' 4-2 loss that tied the series and ensured it would return to Boston. Leaping off the pitcher's mound in celebration was Koji Uehara, the Red Sox's great closer and purveyor of luck, instinct and technical perfection. Here is the truth about Uehara's presence in the Red Sox's advance meetings: He listens to the parts about how to approach hitters with translator C.J. Matsumoto by his side, and the rest – the drudgery, like baserunning – he could just as soon do without. So when he found himself with Wong pinch running, Beltran at the plate and a 1-1 count facing him, he didn't dig into some reservoir of knowledge to outwit the kid. He spun toward first base, caught Wong in between steps leading off, fired a strike to first baseman Mike Napoli, watched Wong slip and kick up dirt, and rejoiced at his fortune when first-base umpire Bill Miller punched out Wong. All Uehara wanted to do was change the rhythm with Beltran, give him a few extra seconds to question whether Uehara would throw a fastball or splitter, the only two pitches in his arsenal. That Wong happened to take an extra step right when Uehara pirouetted was providence for Boston, disastrous for St. Louis and made even worse by Uehara simply guessing that was the proper moment for a pick-off attempt, even though he didn't know for sure whether Napoli was near the bag to field the throw, even though in his 230 career regular-season games Uehara had all of two pick-offs. Down on his knees after Napoli slapped the tag on his right forearm, Wong plucked the batting helmet off his head with his right hand and slammed it to the dirt. Cardinals first-base coach Chris Maloney bellowed: "God dang it!" The Cardinals players stirred in the dugout, as stunned by that ending as the Red Sox were when the obstruction call on Will Middlebrooks gifted the Cardinals a 5-4 victory in Game 3. 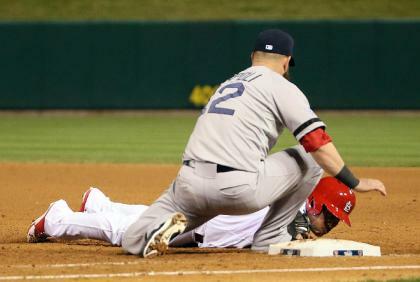 Allen Craig reinjuring his foot on that play actually led directly to Sunday's shenanigans. Craig hammered a Uehara fastball off the right-field wall with one out in the ninth, a sure double for any able-bodied hitter. Craig barely rounded first base, and Wong, he of 32 career games, entered immediately. Uehara, 38, debuted in Japanese professional baseball in 1999. Wong was 8. Around the field, the rest of the Red Sox positioned themselves to make the play possible. Napoli, who came in to play first base two innings earlier during a double switch, hung close to the line because Boston was playing no-doubles defense. He wasn't expecting a Uehara throw, nor had some special moment of magical eye contact. Napoli wasn't all that familiar with Uehara's throws because "no one's really on base when he's pitching." Behind the plate, catcher David Ross was considering how to approach Beltran. 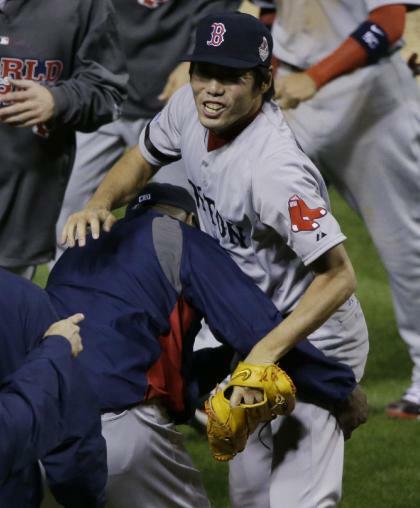 Before he was able to throw down a sign, Ross looked up and saw Uehara whirling toward first. He couldn't have made a better throw. It didn't help that Wong did himself in with a feeble dive back to first. "My foot slipped on me," Wong said. He wasn't even trying to steal. "I'm aware of what's going on," Wong said. "Just got a little too far off and the back foot slipped out." He couldn't help himself from crying. "He just made a good throw, I slipped and that was it." Wong turned around and sat down at his locker, his head in his hands, his uniform still fully on. His teammates said all the right things – "I don't think this series is going to be turned or defined by that," Craig said – but Wong understands how this game works. Every out in the World Series is precious. Beltran worked nearly 20 years to get here for the first time. To deny him that opportunity – to leave him standing there with the bat on his shoulder to end a postseason game again – was not a feeling that would wash away in minutes or hours. "In that situation," Red Sox pinch runner Quintin Berry said, "you want to throw up." The Red Sox, on the other hand, toasted the karmic balance of the baseball world returning to stasis. Game 3 ended in such weird fashion, to see Game 4 almost equal it less than 24 hours later left Uehara and Napoli jumping into one another with a double high five and the rest of the Red Sox harkening back to that advance scouting meeting where they heard about the kid who may just be vulnerable. That the vulnerability showed with two outs in the bottom of the ninth inning of a World Series game left them shocked nonetheless. Games do end in pick-offs. Jose Veras nabbed Jordan Danks at second base in June. Jordan Walden used a third-to-first move to catch Curtis Granderson trying to swipe second in 2011. Five years earlier, a young catcher named Yadier Molina threw behind the hitter and let a first baseman named Albert Pujols lay a game-ending tag on Brian Giles. Even if walkoff pick-offs are among the rarest of 27th outs, they do happen, and it's why teams so value their scouts. "There's nothing that's missed at this point in time. Nothing," Red Sox starter Jake Peavy said. "Something as big as what happened to end the game doesn't happen as much. A lot of times, the opportunity doesn't present itself." Usually it's smaller stuff. Where to pitch a hitter, or how to sequence the pitches, or some sort of intricacy Koji Uehara may or may not have listened to. This is the World Series of Weird, of course, the place where unlikely turns to likely, where gut feelings rule the day and where three games remain to remind us just how crazy baseball can be.